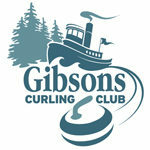 From that group of interested citizens, a non-profit society was formed in November,1973 and named the Gibsons Winter Club (later to be renamed the Gibsons Curling Club in the early 1990's). The club's constitution states its purpose is for the recreation of the sport of curling and to promote curling in all its forms. Having no land available, the society turned to the Province and the Village of Gibsons council to have Crown land made available. A delegation, made up of the society executive and village aldermen, traveled to Victoria to persuade the province. After extensive work and presentation, the 5 acre parcel of land fronting on the highway, was procured from the Crown for the village and designated for the sole purpose of recreation in March, 1974. Construction began in 1975. The rink area of the building was completed in time for curling to begin in January of 1976. The lobby, washrooms, kitchen and lounge were completed in 1976. 1. The sale of debentures sold to the community for $200 each, approximately $70,000 worth. 2. In addition, 2 loans totaling $80,000 were obtained and co-signed by members. 3. The remainder of the construction of the facility was completed through volunteer labour and donated materials, totaling over $100,000 in value. No construction funding or operating expeditures of the Gibsons Curling Club was received from the municipality of Gibsons. The Gibsons Curling Club is proud of its financial sustainability, responsibility and independence. All capital expenditures both exterior and interior and general upkeep of the 15,000 plus square foot facility and equipment, have been funded by the club and its members.